Open-source electronics are becoming more prevalent in biological sciences, enabling novel and unique means of data acquisition. 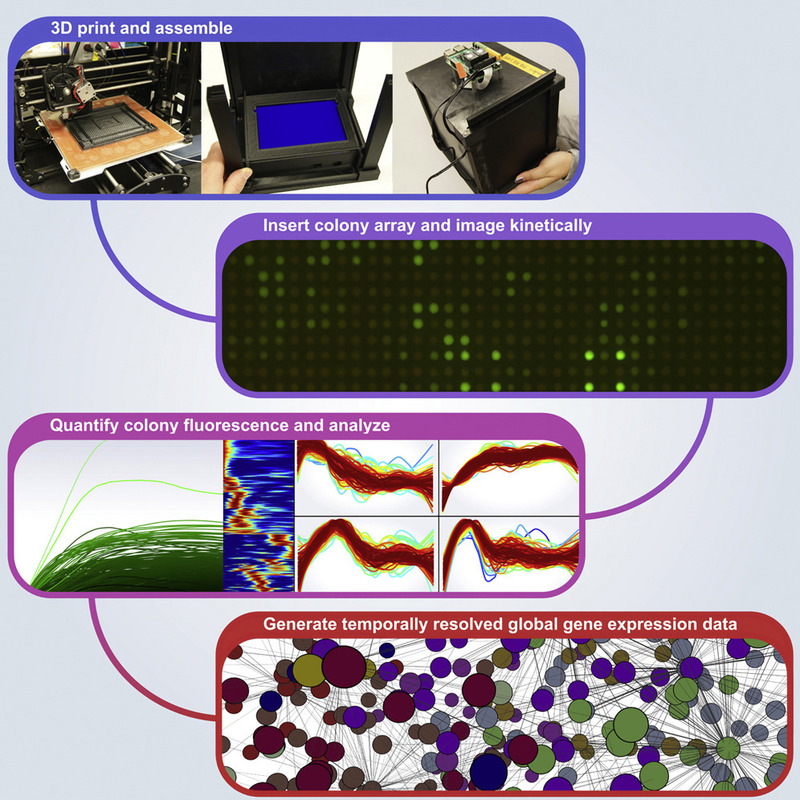 Here, we present 3D-printed, open-source tools to acquire fluorescence phenotypes with high temporal resolution. Printed fluorescence imaging boxes (PFIboxes) cost approximately 200 US dollars to assemble, can be placed in incubators or hypoxic chambers, and accurately read high-density colony arrays of microorganisms. We demonstrate the utility of PFIboxes using a time course gene expression approach, examining global Escherichia coli promoter activity using a fluorescent reporter library across a diverse panel of 15 antibiotics, each at several concentrations. Many secondary and indirect effects were observed when E. coli was challenged with various drugs, including increased gene expression in carbon metabolism processes. Further, kinetic data acquisition enabled non-destructive time course gene expression, clustering of which revealed patterns of co-expression. In all, PFIboxes provide an open solution to gene expression, for about 2 US dollars per treatment condition, including technical replicates. French S, Coutts BE, Brown ED. © Copyright 2016 Brown Lab. All Rights Reserved.